Specialty foods is a unique but wide-ranging category with one important commonality: high margins. Not up for an Oscar or an Emmy this year? No Golden Globe in sight? You could still walk away with a SOFI. The Specialty Outstanding Food Innovation (SOFI) prize is awarded each year to the best innovators in the specialty foods category by the National Assn. for the Specialty Food Trade (NASFT). NASFT defines specialty foods as "foods of premium quality that are often made by small or local manufacturers or have exotic or ethnic flavors," says Louise Kramer, communications director for the New York-based association (www.specialtyfood.com). The descriptors "specialty," "premium" and "exotic" should be read as "high margin" by small and large food processors alike. These products have great potential, although they also may require more intensive product development effort. 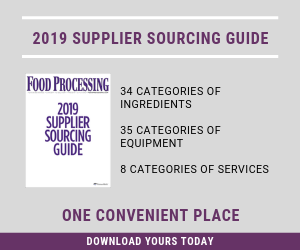 The top five categories of specialty foods most purchased last year were cheeses; condiments; frozen and refrigerated entrees, pizzas and convenience foods; chips, pretzels and snacks; and frozen and refrigerated meats, poultry and seafood. This is no plain vanilla: Silver Moon adds a touch of Tennessee bourbon plus vanilla bean to its vanilla ice cream. Since 1972, the SOFIs, formerly known as the NASFT Product Awards, have honored the most outstanding representatives of the specialty foods industry. At first, the only two categories awarded were Outstanding Domestic Product and Outstanding Imported Product. Most of the specialty foods on the market at that time came from Europe. Today, however, the specialty foods category has greatly expanded. There are awards for appetizers, baked goods, chocolates, condiments, diet products, organic products, soups, sauces, dressings, beverages, meats and seafood and more. In fact, they cover 33 award categories, which reflect the breadth and diversity of the specialty food category. They also have their own trade show; actually two. NASFT's Summer Fancy Food Show was in New York June 27-29, just about the time this magazine was going to press. The next Winter Fancy Food Show will be in San Francisco Jan. 16-18, 2011. What does it take to create an award-winning specialty food? An inspired idea, some real-life experience and a ton of technical know-how. Sheri Tate, creator, president and CEO of Silver Moon Desserts (www.silvermoondesserts.com), Los Gatos, Calif., left a successful 12-year career as a Silicon Valley technology industry executive to turn a hobby into an award-winning dessert. Inspired by memories of her mother's locally renowned, hand-cranked ice cream and sorbet desserts, Tate turned technical savvy into culinary art and in 2008 launched Silver Moon Desserts. The company specializes in sophisticated, "adults-only" delights made from fresh, natural ingredients, locally produced milk and premier liqueurs. In 2009, Silver Moon Desserts earned the SOFI Silver Award from the NASFT for Outstanding Product Line. The Nibble, a specialty food publication, also honored Silver Moon Desserts with its 2009 Fancy Food Show Silver Star for excellence and innovation. Originally serving only caterers, country clubs and high-end hotels and restaurants, Silver Moon Desserts expanded into retail last year. As the categories of the SOFIs have expanded so have the ingredients that serve the artists — their palette of the palate, so to speak. The expansion of categories has come to match span of consumer interest, from placing a premium on pure gourmet tastes to the marriage of health and culinary art. All categories are represented with enthusiasm, and all find support in the innovations of ingredient providers. "It's insightful to frame innovation as it relates to food," says Cecilia McCollum, executive vice president of Blue California (www.bluecal-ingredients.com), Rancho Santa Margarita Calif., which specializes in "highly purified botanical extracts and specialty ingredients using raw materials from around the world." McCollum continues: "Artists always push the limits, and our innovative ingredients are designed to offer a way for these artists to create better foods that also offer health benefits and longevity." According to McCollum, the need to reduce sugar intake and offer foods with lower calories will continue to push culinary artists toward considering ways to improve their new creations while considering functionality. Perhaps a small step in that direction was Blue California's late-June announcement that its stevia-derived sweetener Good&Sweet will be available early next year via a more-natural fermentation process. "It gives culinary artists a way to produce deliciously sweet delicacies, desserts and confectionaries while reducing calories and permitting the important ‘all-natural' label designation," she explains. "While the creation of a specialty food may start with an idea, it must be supported with the right ingredients, packaging and manufacturing technology," says Winston Boyd, vice president and chief chemist for Lawrence Foods Inc. (www.lawrencefoods.com), Elk Grove Village, Ill. Lawrence Foods specializes in designing and creating fillings and toppings, bar components, bakery mixes and a number of menu kits that satisfy the unique performance requirements of processors in need of special applications. "A critical part of the specialty product development process is having a complete understanding of the vision of the chef or food scientist creating the final product," adds Boyd. "You have to start by engaging the most basic of skills: listening, asking questions and collaborating with the designer to develop a mutual understanding. From here it's a matter of employing creativity in utilizing the resources at our disposal to forge a unique solution that addresses the technical and performance challenges. We use a combination of broad and deep technical skills coupled with an intuitive insight into food and processing systems so we can routinely deliver the functionality and appeal that our customers seek." According to Boyd, this strategy can involve something as simple as a new flavor or color, or it may involve a complex set of performance criteria that, taken together, allow the manufacturer to successfully make a specialty food. As an example, he points to the constant pressure to formulate all-natural and organic ingredients that perform comparably to traditional ingredients that do not meet these more stringent requirements. "The limited array of compliant ingredients, especially functional ingredients like emulsifiers and processing aides, can make this a daunting challenge," admits Boyd. "Overcoming such limitations requires not simply perseverance but also a substantial understanding of processing and ingredient technology—plus the occasional spark of inspiration." Beverages are a category of specialty foods that has grown rapidly in recent years. There have been more and more innovative varieties, but one thing many of the non-clear beverages have in common is soy. As a beverage ingredient, soy has skyrocketed in popularity due in no small part to its versatility and its reputation as a functional food. "Soy protein has a lot going for it from both a health and environmental perspective, the latter of which is becoming increasingly important with consumers," says Mark Messina,a soy expert and adjunct associate professor at Loma Linda University. "Our customer base continues to grow in response to our significant portfolio of liquid and dry soy protein ingredients," says Scott Desing, vice president at Devansoy Inc. (www.devansoy.com), Carroll, Iowa. Devansoy offers both organic and conventional, non-GMO varieties of soy protein suited to a comprehensive category of customers that produce private label soy milk, frozen desserts, healthy cereals and baked goods. "Our development of beverage prototypes, such as Indulgent Soy and 4 Soy, have been a launch-pad for specialty product partnerships between Devansoy and a number of clients," Desing adds. In the process of creating new and unique dairy alternative beverages, one technical problem arises: If comparable calcium levels are to be reached, there's a risk of calcium sedimentation, which can lead to compromised taste and texture. Gadot Biochemical Industries Ltd. (www.gadotbio.com), Haifa Bay, Israel, developed its Gadocal K form of calcium to enable fortification of soy milk and enrichment of milk drinks with the important mineral. A patented calcium-potassium citrate compound, Gadocal K is specifically designed for the fortification of dairy alternative beverages so they can be formulated without the addition of any stabilizers. Still, the highly bioavailable form of calcium produces no coagulation of proteins yet can achieve a stable calcium suspension at up to 30 percent of the RDA. This is crucial as one of the main competitive points of dairy versus non-dairy beverages becomes the calcium content. Two of the top five categories of specialty foods most purchased last year included cheese and pizza. "We worked with a number of artisan cheese makers to create our consumer line of artisan blend cheeses," says Barbara Gannon, vice president of corporate communications and government relations for Sargento Foods Inc. (www.sargento.com), Plymouth, Wis.
Sargento says specialty cheese by blending its Swiss cheese with the gruyere of another cheese maker, Roth Kase. "Artisan cheese makers craft their product using traditional cheese-making techniques and fresh ingredients often unique to their particular growing region," she continues. "This gives their products unique, distinctive, robust flavor profiles. We work with the cheese makers to co-develop products ensuring customer expectations are consistently met regarding flavor, melting characteristics, overall quality and food safety. Our team includes R&D scientists, chefs, sensory evaluation and cheese makers; quality managers including cheese graders and procurement specialists. We're also able to contribute our years of packaging innovation expertise, so that end products get to customers and consumers in a user-friendly container." So what should we look for in specialty food trends of the future? If the health concerns of consumers continue to make inroads, items such as highly functional beverages, exotic ingredients with nutraceutical adjuncts and vitamin-fortified baked snacks consumers can access and enjoy quickly and conveniently, yet still get 100 percent of essential vitamins and minerals every morning. To this end, baked goods that have gourmet flair will be a typical example. That was the idea driving Vitalicious Inc., (www.vitalicious.com), New York, maker of innovative "vital and delicious" baked goods. First to market with 100-calorie servings, Vitalicious focused as its specialty on a simple mission: to make healthy and delicious baked goods fortified with essential vitamins and minerals, with no sacrifice of flavor or texture — "hidden health," if you will. The company posts as its long-term mission a continuing desire to "create baked goods that are healthy in many more ways than just being vitamin-enriched -- gourmet-tasting baked goods that provide high fiber, low calories, or without any fat, as well as crucial omega-3 fatty acids and protein." In the past few years, the number of Americans who are grabbing a snack or a meal on the run is surging. While some may see this as having changed the paradigm for creating true specialty products, they admit there is a need for healthy alternatives that re-imagine a widening class of specialty products. The merging of the two concepts has only served to broaden both categories of foods and beverages into the realm that of "special." And that's a good thing.